After sharing our dinner theatre menu a couple of weeks ago, I was asked for my recipe for Red Velvet Cake. Well, wouldn't you know, we went the quick and easy route for the theatre meal, and relied on a good ole Betty Crocker mix. But I do have a family recipe for this historic cake, and I'm happy to share that today. This frosting is a traditional roux frosting, which is what my mom used on Red Velvet when I was growing up. 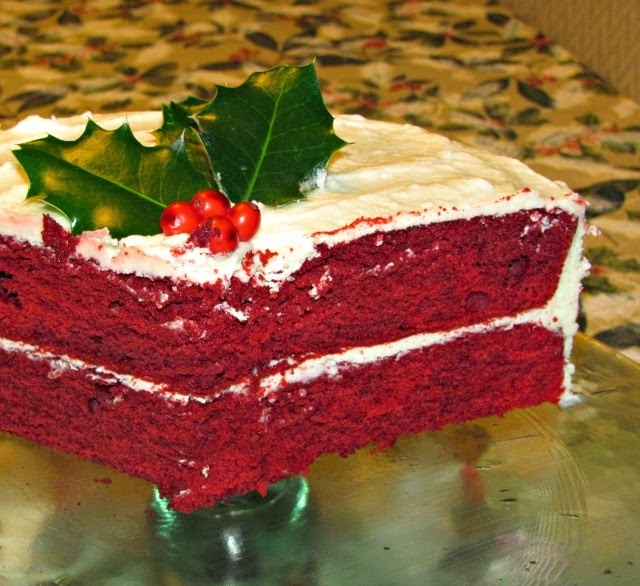 These days, Red Velvet is most often served with a cream cheese frosting. Take your pick! Cream shortening & sugar. Add eggs; beat well. Make paste of cocoa & food coloring. Add to mix. Combine salt, vanilla, & buttermilk together – add alternately with flour to mixture. Combine soda & vinegar. Fold into mixture without beating. Fill two greased & floured 9” layer cake pans. Bake 30 minutes at 350-degrees. For frosting, cook flour & milk; stir constantly till thick; cool slightly till warm, stirring occasionally. Cream sugar & butter; add vanilla. Add small amount of creamed mixture to flour/milk paste which assures a smooth icing. With mixer, add small amounts of paste to creamed mixture till it has appearance of whipped cream. Frost cooled cake layers. The last time I made this cake, it was for Christmas, thus the holly in the photo. If perchance you love red velvet but want something a little different, be sure and try the Red Velvet Cake Balls I've shared in a previous post. Either way, there's some good eats! This looks lovely, thanks so much for sharing. And thank you for the real cake recipe. I live in Switzerland and we really don't do cake mixes so it is always great to find new recipes for cakes that mare made from scratch rather than from a box as so many seem to be these days. I look forward to trying this one out. This looks just like my mom's recipe. Love the cooked frosting! She always made this for my birthday when I was growing up. It will always be my favorite! Awesome Debbie! THANK YOU SO MUCH! I used to have this recipe and haven't been able to locate it. A friend had volunteered to make this cake a number of years ago and after failing three times at the frosting, she called me since I lived down the street and she knew I'd be able to get it done right. I had never seen this type of frosting before and was skeptical about her maybe copying it wrong but I tried it. First time perfect with no problems at all. And then when it was done, I tasted it and OH MY GOSH, this stuff is amazing and totally addicting too. I copied her recipe she had been given to make this cake so I could have a copy of it too. Then I made more for my own family and at some point the recipe was lost. I searched online but didn't see one that looked exactly the same so I had given up. I was so happy when I saw you had posted it. Now I can make one again. I hope anyone who reads this tries this frosting recipe. Even as much as I absolutely LOVE Cream Cheese frosting, this recipe is perfect for this cake. So happy to have this recipe--I'm trying it out today for some company (but making cupcakes). I think that recipe for the frosting is interesting. I've only made frosting like that one other time, but this time (because of cooking the rest of the meal) I picked up some frosting in a can. Can't do it all, but the cake is the important part. Thank you, thank you!! this looks like my recipe too! I haven't made it in ages! Looks delicious!!! Red Velvet Cake is an absolute favorite of mine. Lately, my frosting fails almost every time so I'm very pleased to try yours as it's ingredients are a bit different. The flour frosting is so fabulous on this cake and much preferred over cream cheese. Thanks for sharing! That is my favorite frosting ever! My mom made it when I was a kid. I have a version of it that uses cornstarch and butter and assures no lumps. You just took my back to my childhood. Thank you.